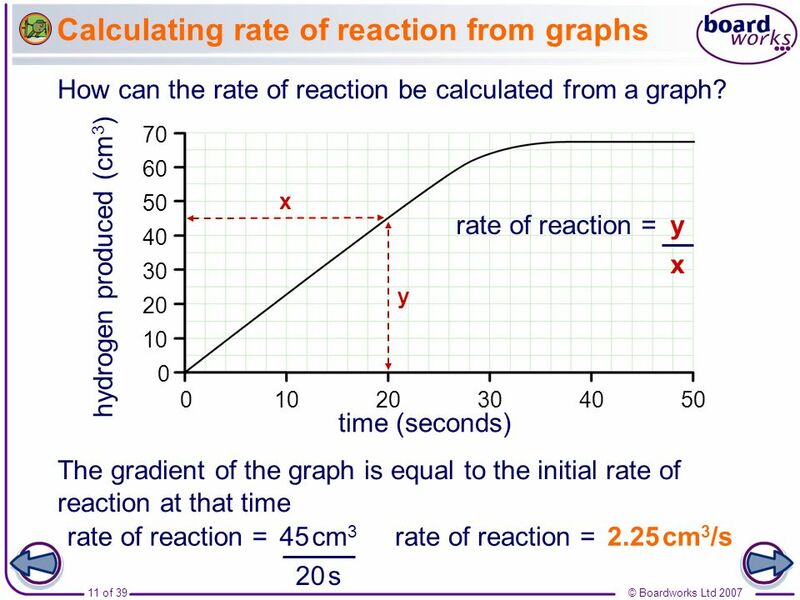 3 What does rate of reaction mean? Why are some reactions faster than others? 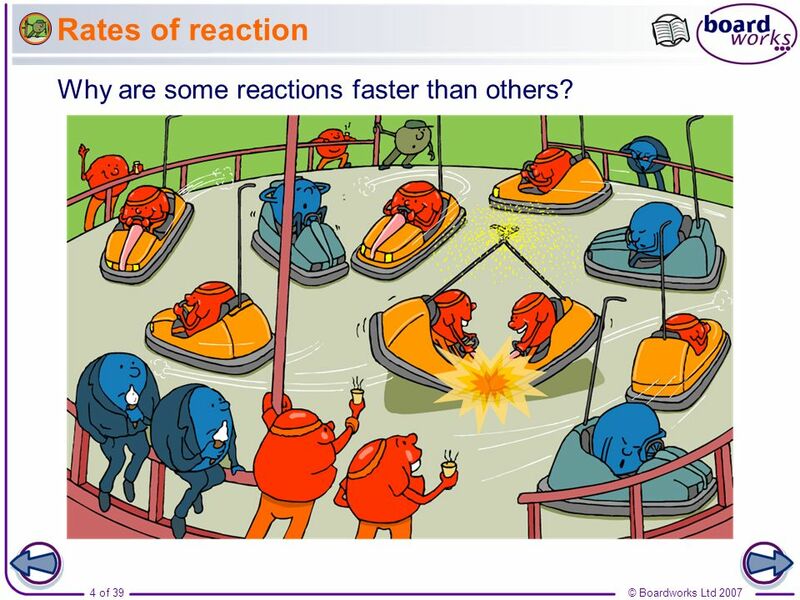 Teacher notes This illustration contains several discussion points relating to rates of reaction, including: Red characters: these represent particles that have a large amount of kinetic energy and are therefore likely to react. Blue characters : these represent particles that have a small amount of kinetic energy and are therefore unlikely to react (hence why some are asleep). Bumper cars: the collision between two bumper cars represents the large amount of energy released during a reaction. 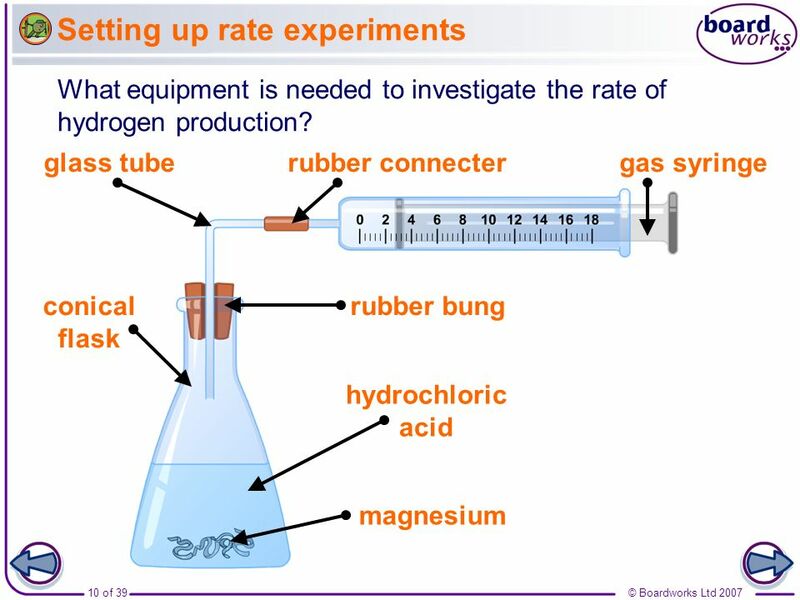 Boardworks GCSE Additional Science: Chemistry Rates of Reaction The change in concentration can be measured by using any property that changes during the reaction. These may include Mass or volume changes for gaseous reactions. Change in pH for reactions involving acids and bases. Changes in conductivity measurements for reactions involving electrolytes. Teacher notes See the ‘Energy Transfer’ presentation for more information on activation energy. 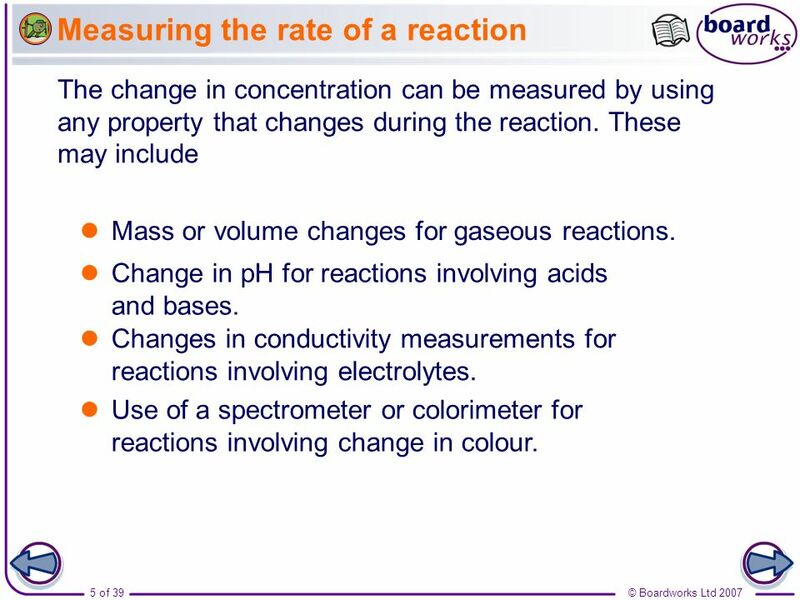 Use of a spectrometer or colorimeter for reactions involving change in colour. 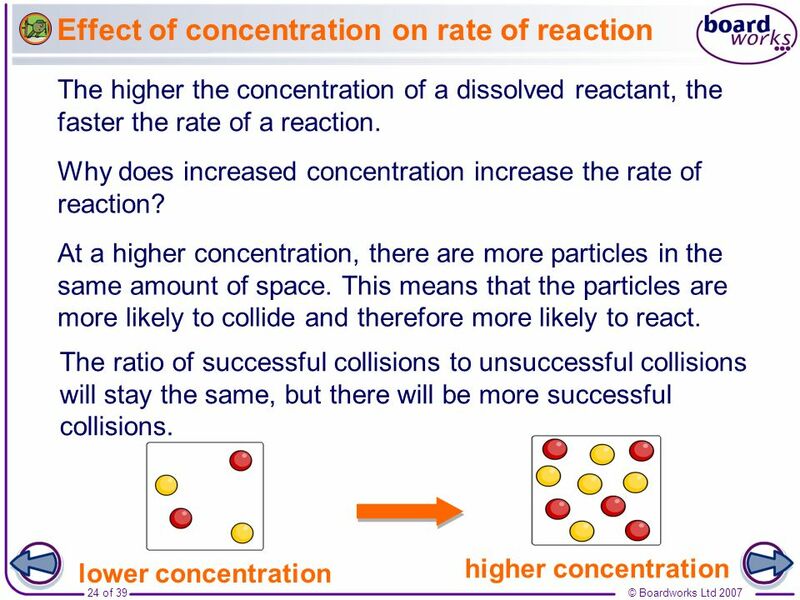 Collision Theory Boardworks GCSE Additional Science: Chemistry Rates of Reaction For a reaction to take place between two reactant particles, three conditions are necessary: The two particles must collide with each other. 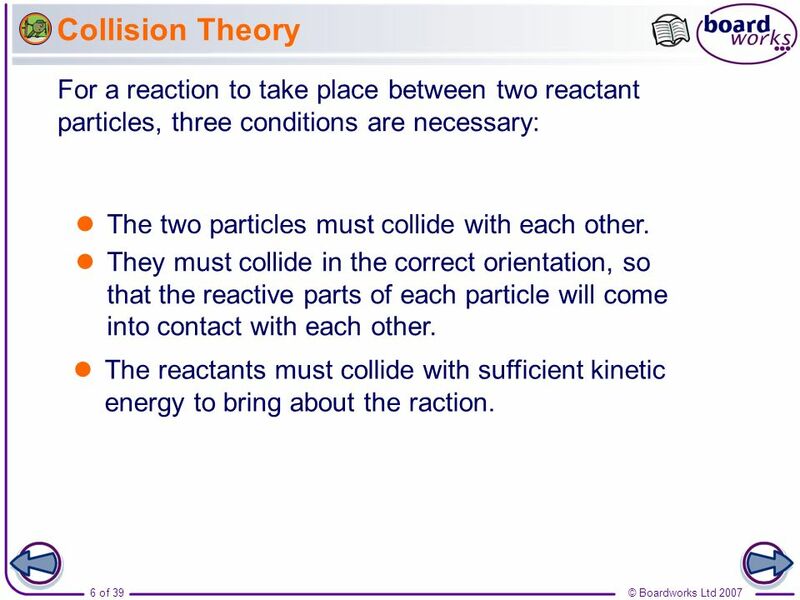 They must collide in the correct orientation, so that the reactive parts of each particle will come into contact with each other. The reactants must collide with sufficient kinetic energy to bring about the raction. Teacher notes See the ‘Energy Transfer’ presentation for more information on activation energy. 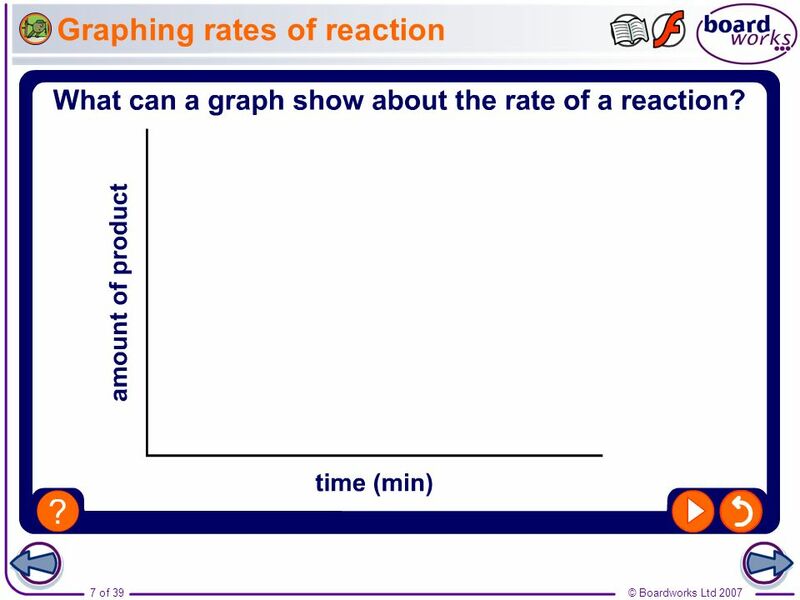 Boardworks GCSE Additional Science: Chemistry Rates of Reaction Teacher notes This animated graph summarizes the qualitative information provided by the gradient of a graph that plots amount of product in a reaction against time. 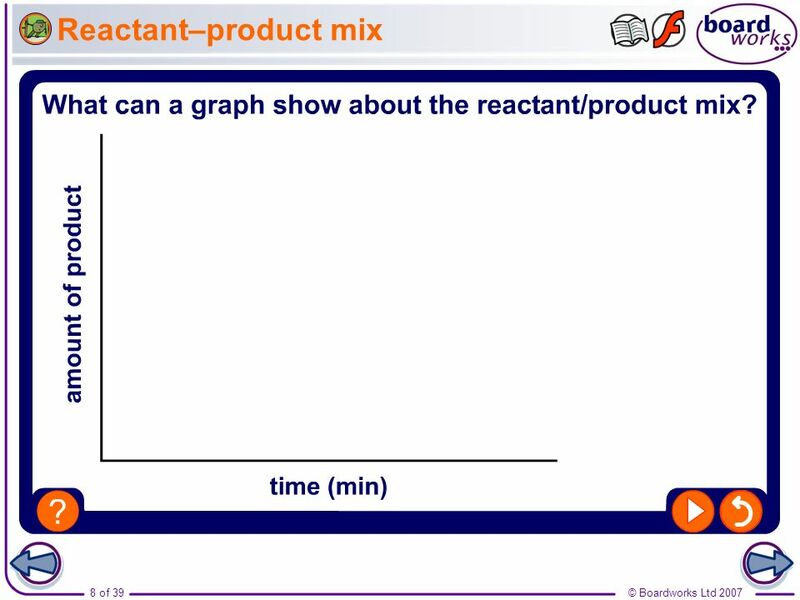 Reactant–product mix Boardworks GCSE Additional Science: Chemistry Rates of Reaction Teacher notes This animated graph follows-on from the graph on the previous slide, and illustrates how the change in the rate of a reaction can be explained in terms of changing amounts of reactants and product. 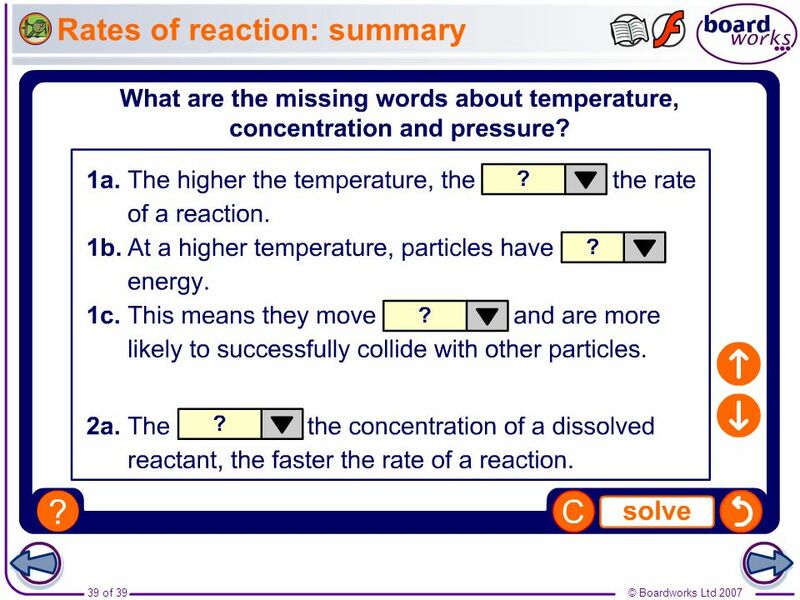 Boardworks GCSE Additional Science: Chemistry Rates of Reaction Teacher notes This drag and drop activity provides the opportunity for informal assessment of students’ understanding of how the rate of reaction varies with the relative amounts of reactants and product. 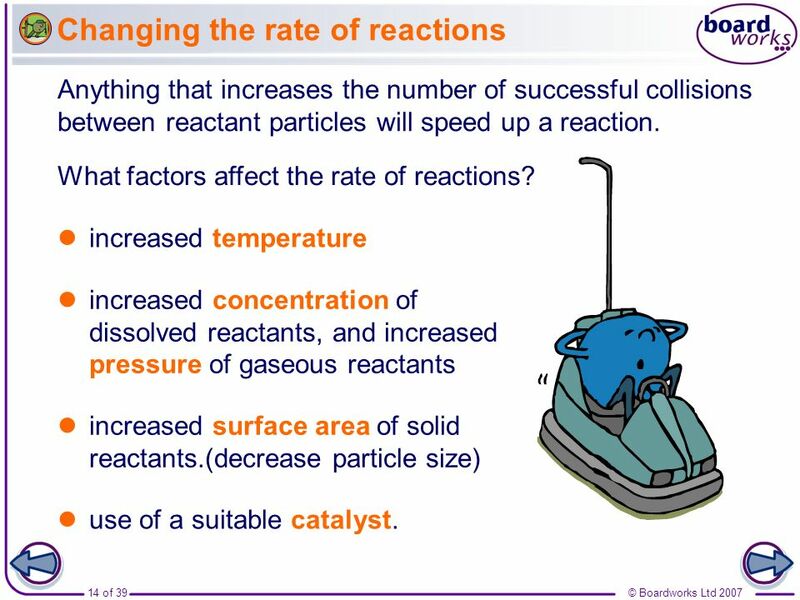 Boardworks GCSE Additional Science: Chemistry Rates of Reaction Anything that increases the number of successful collisions between reactant particles will speed up a reaction. 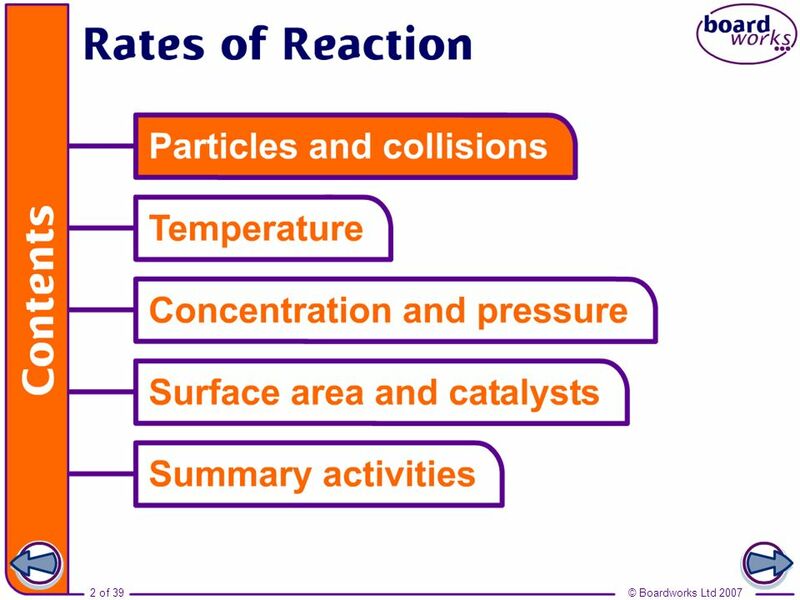 What factors affect the rate of reactions? increased temperature increased concentration of dissolved reactants, and increased pressure of gaseous reactants increased surface area of solid reactants. (decrease particle size) use of a suitable catalyst. 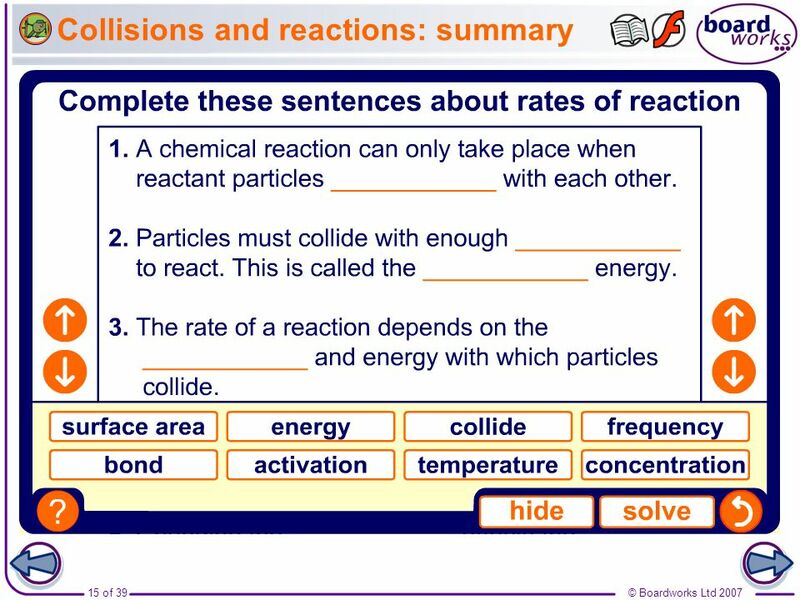 Boardworks GCSE Additional Science: Chemistry Rates of Reaction Teacher notes This completing sentences activity could be used as a plenary or revision exercise on rates of reaction. Students could be asked to write down the missing words in their books and the activity could be concluded by the completion on the IWB. 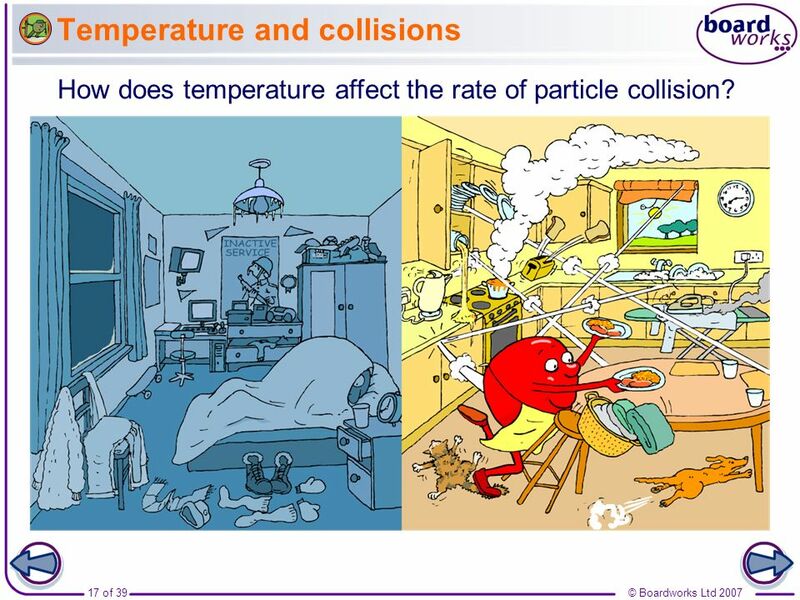 Boardworks GCSE Additional Science: Chemistry Rates of Reaction How does temperature affect the rate of particle collision? 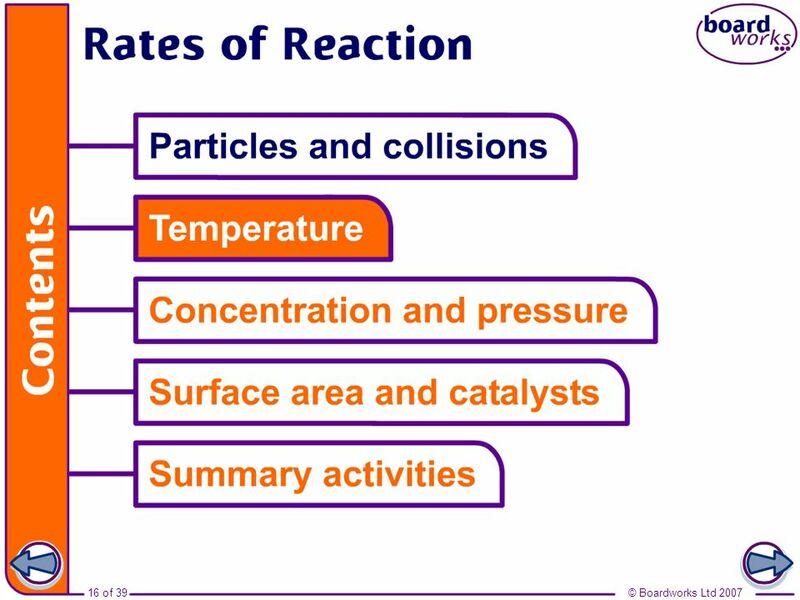 Boardworks GCSE Additional Science: Chemistry Rates of Reaction The higher the temperature, the faster the rate of a reaction. In many reactions, a rise in temperature of 10 °C causes the rate of reaction to approximately double. 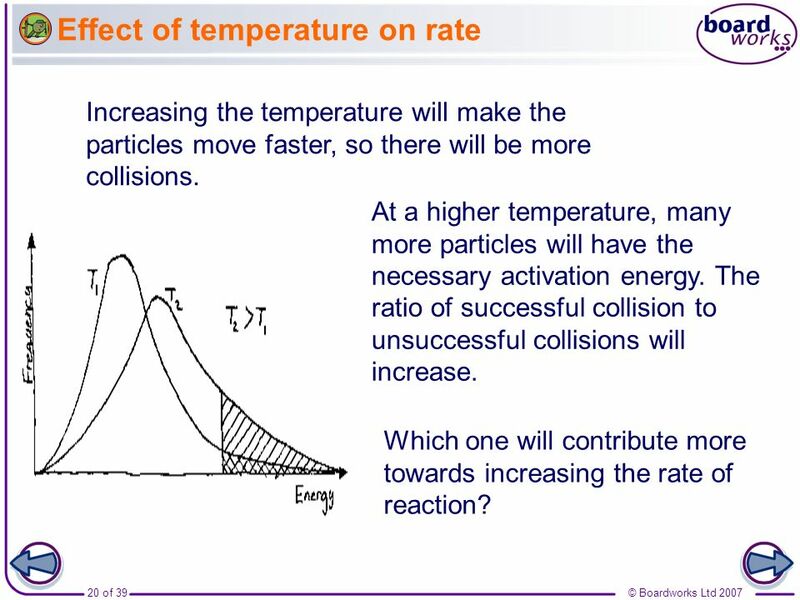 Why increasing the temperature will increase the rate of reaction? 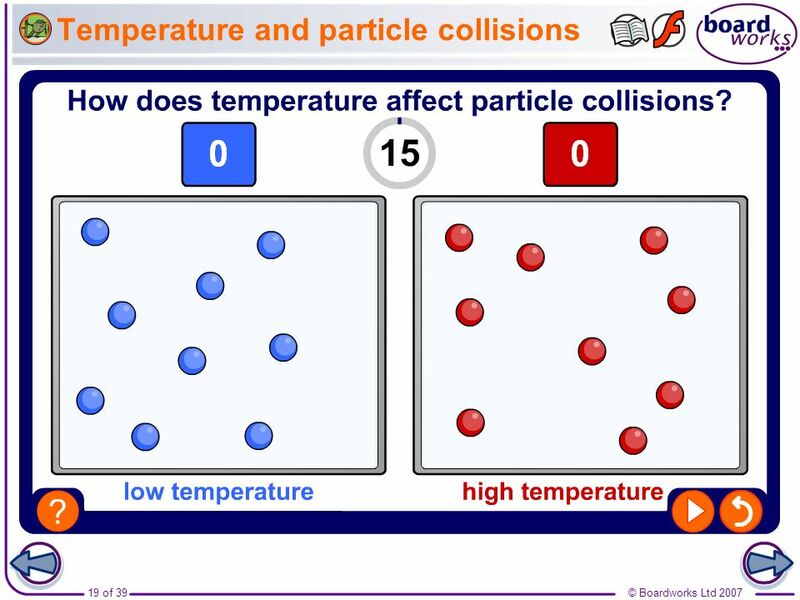 Boardworks GCSE Additional Science: Chemistry Rates of Reaction Teacher notes This simulation illustrates how increasing the temperature increases the number of collisions between particles. 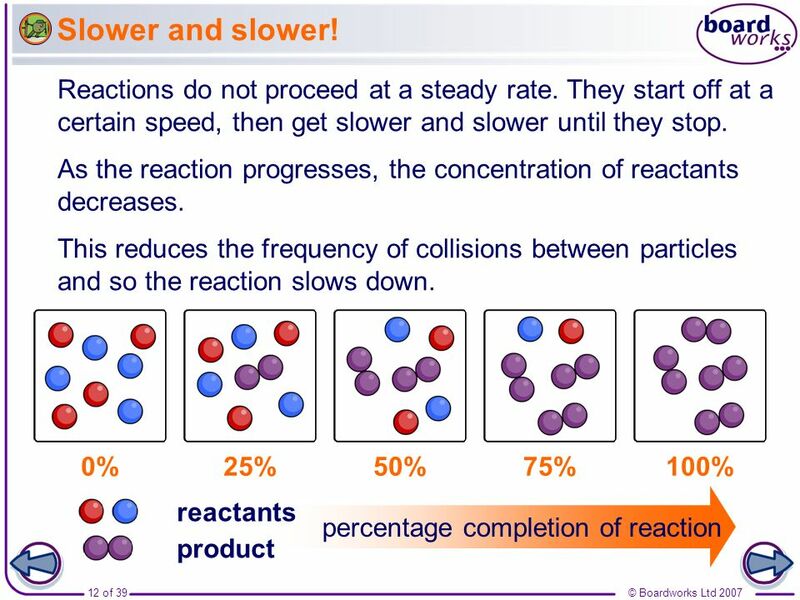 Boardworks GCSE Additional Science: Chemistry Rates of Reaction Increasing the temperature will make the particles move faster, so there will be more collisions. At a higher temperature, many more particles will have the necessary activation energy. The ratio of successful collision to unsuccessful collisions will increase. 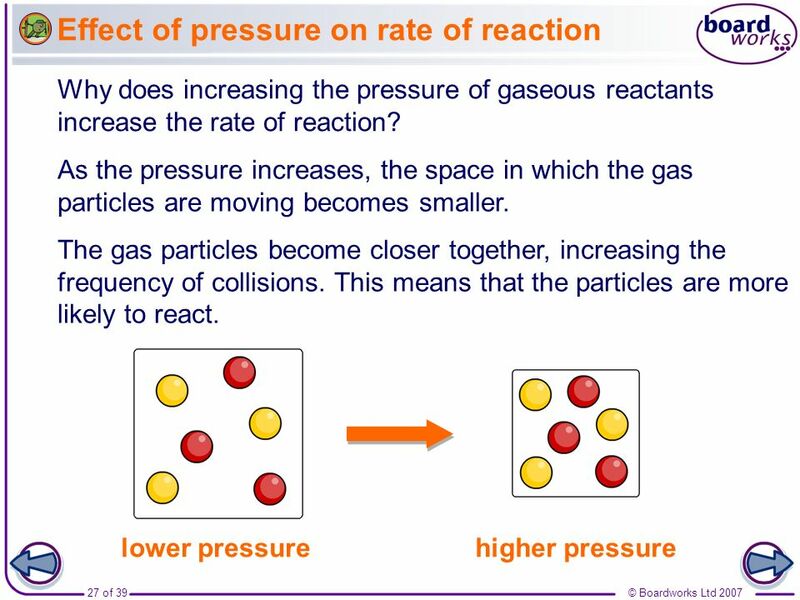 Which one will contribute more towards increasing the rate of reaction? 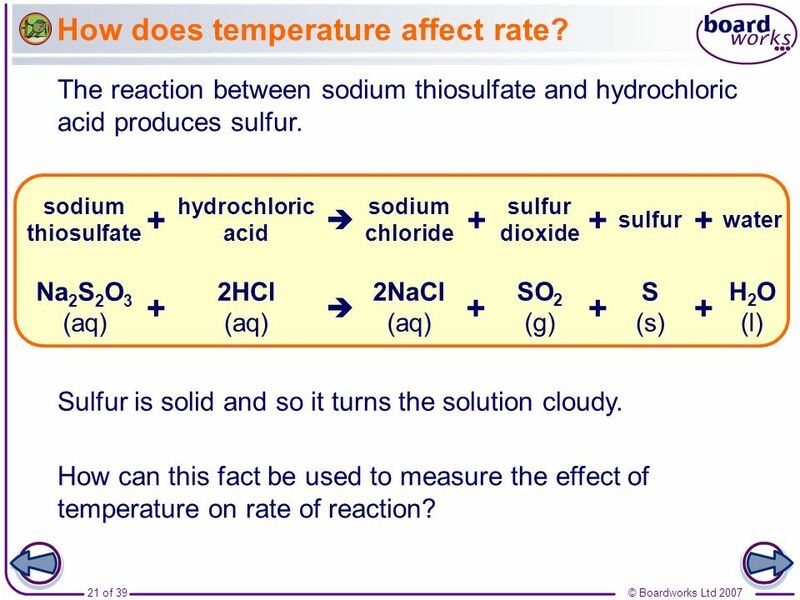 21 How does temperature affect rate? Boardworks GCSE Additional Science: Chemistry Rates of Reaction The reaction between sodium thiosulfate and hydrochloric acid produces sulfur. hydrochloric acid sodium chloride sulfur sodium thiosulfate +  water sulfur dioxide Na2S2O3 (aq) 2HCl (aq) 2NaCl (aq) S (s) +  SO2 (g) H2O (l) Sulfur is solid and so it turns the solution cloudy. 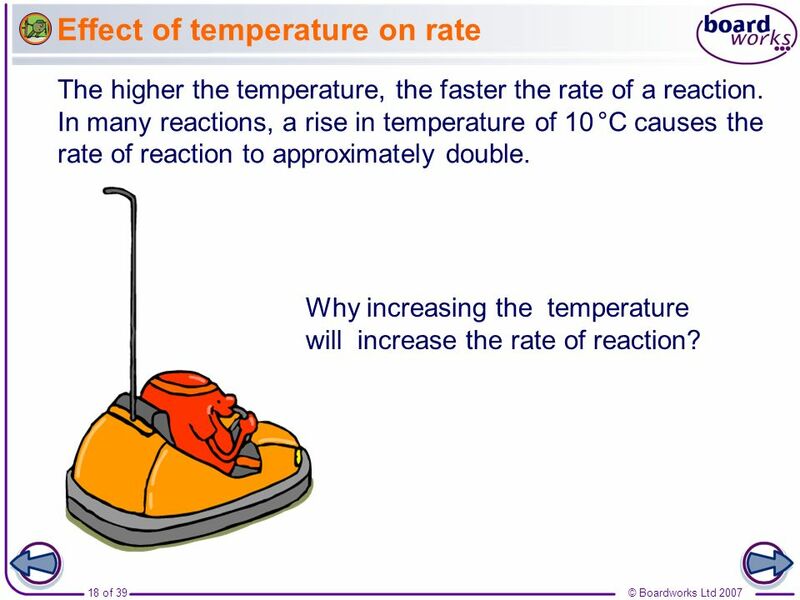 How can this fact be used to measure the effect of temperature on rate of reaction? 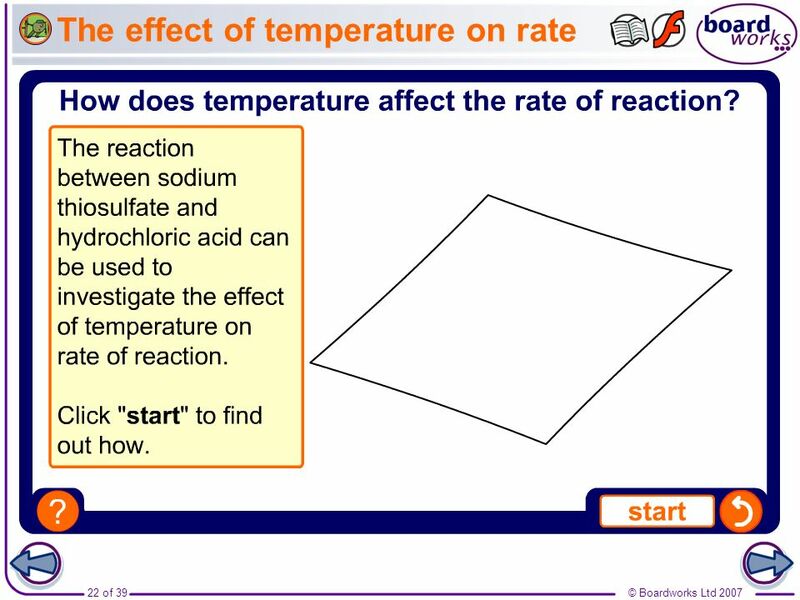 Boardworks GCSE Additional Science: Chemistry Rates of Reaction Teacher notes This animation can be used to introduce the reaction between sodium thiosulfate and hydrochloric acid as a way of measuring the effect of temperature on rate of reaction. It could be shown as precursor to running the experiment in the lab, or as a revision exercise. 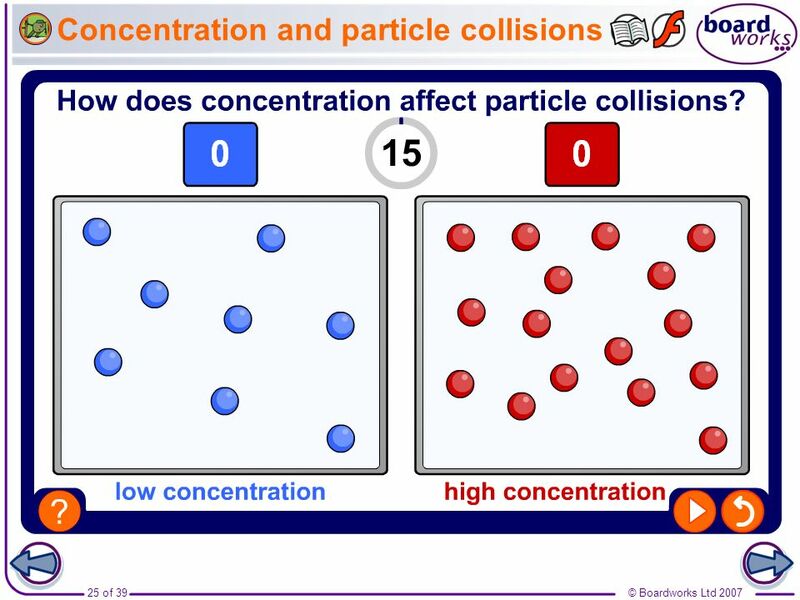 Boardworks GCSE Additional Science: Chemistry Rates of Reaction Teacher notes This simulation illustrates how increasing the concentration increases the number of collisions between particles. 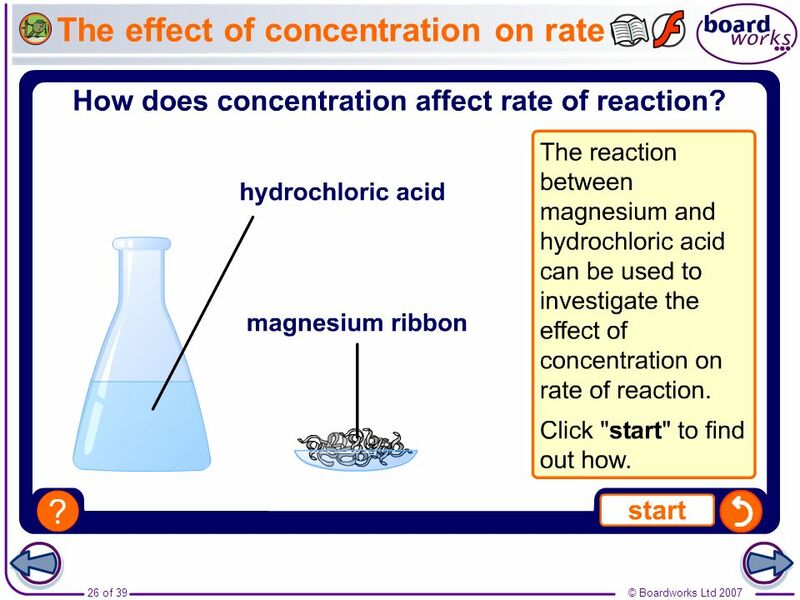 Boardworks GCSE Additional Science: Chemistry Rates of Reaction Teacher notes This animation can be used to introduce the reaction between magnesium and hydrochloric acid as a way of measuring the effect of concentration on rate of reaction. It could be shown as precursor to running the experiment in the lab, or as a revision exercise. 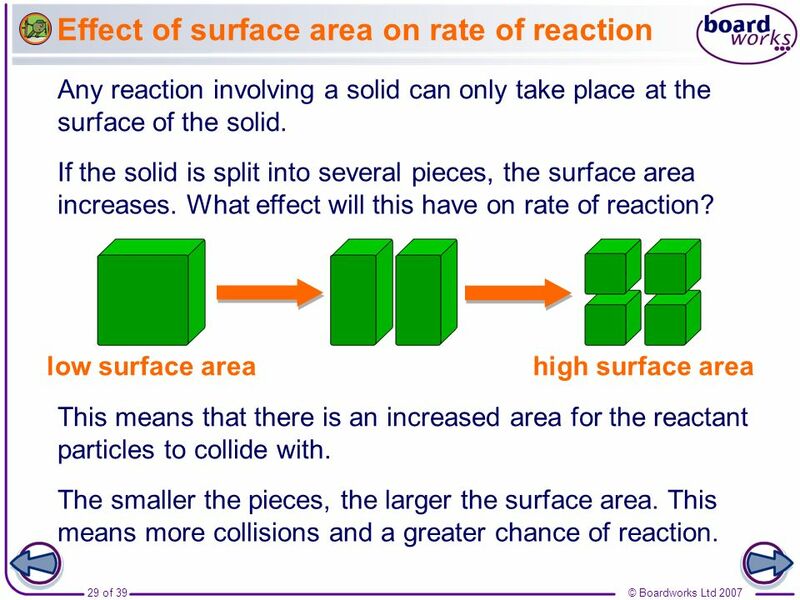 Boardworks GCSE Additional Science: Chemistry Rates of Reaction Any reaction involving a solid can only take place at the surface of the solid. If the solid is split into several pieces, the surface area increases. What effect will this have on rate of reaction? 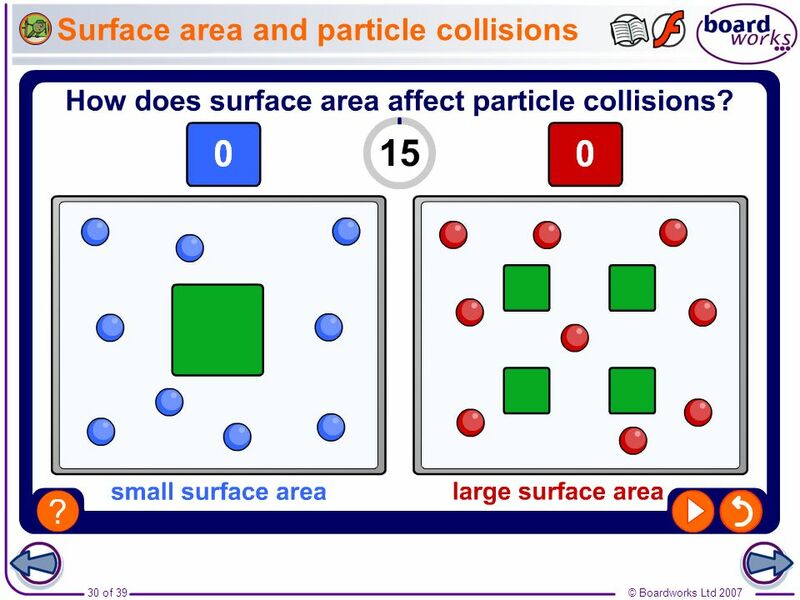 low surface area high surface area This means that there is an increased area for the reactant particles to collide with. The smaller the pieces, the larger the surface area. This means more collisions and a greater chance of reaction. 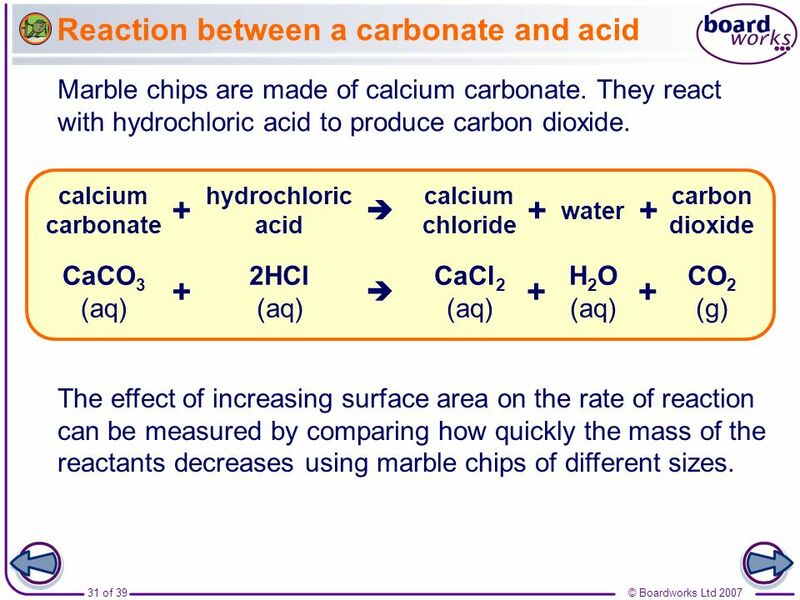 Boardworks GCSE Additional Science: Chemistry Rates of Reaction Marble chips are made of calcium carbonate. They react with hydrochloric acid to produce carbon dioxide. hydrochloric acid calcium chloride calcium carbonate +  water carbon dioxide CaCO3 (aq) 2HCl (aq) CaCl2 (aq) +  H2O (aq) CO2 (g) The effect of increasing surface area on the rate of reaction can be measured by comparing how quickly the mass of the reactants decreases using marble chips of different sizes. 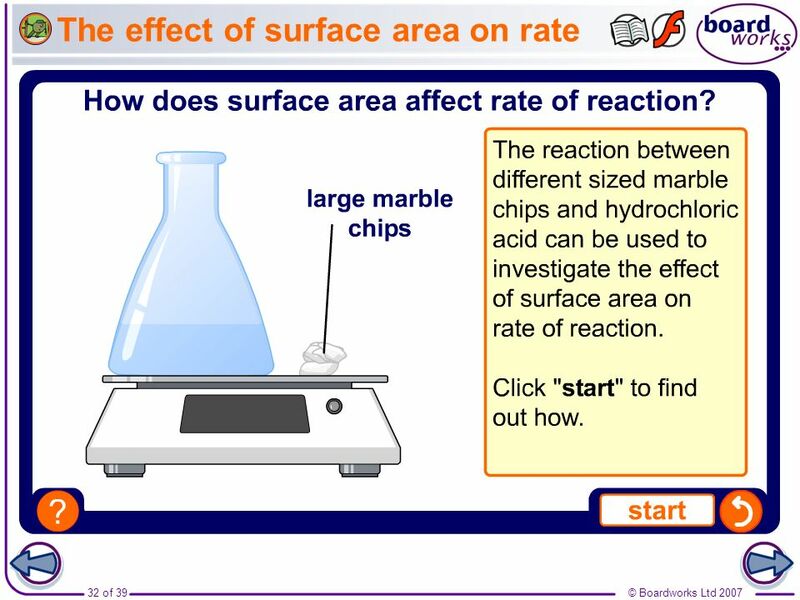 Boardworks GCSE Additional Science: Chemistry Rates of Reaction Teacher notes This animation can be used to introduce the reaction between marble chips (calcium carbonate) and hydrochloric acid as a way of measuring the effect of surface on rate of reaction. It could be shown as precursor to running the experiment in the lab, or as a revision exercise. 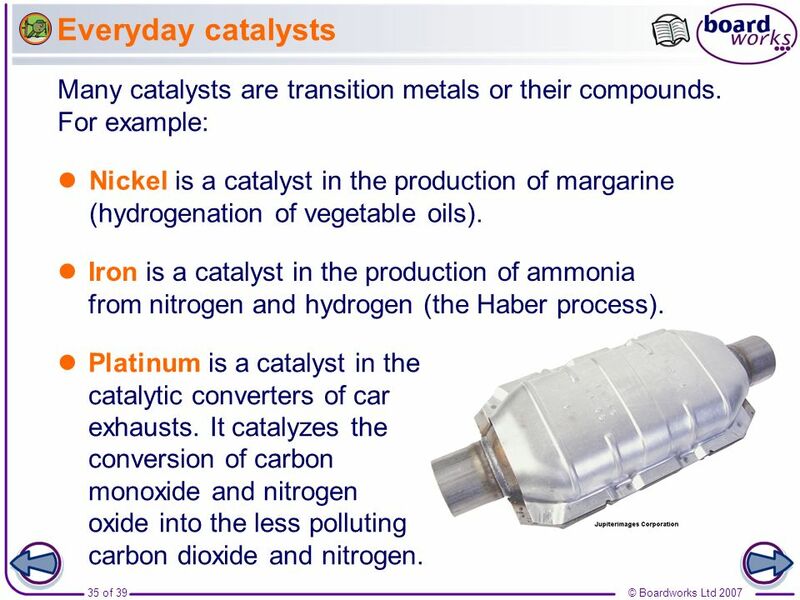 What are catalysts? 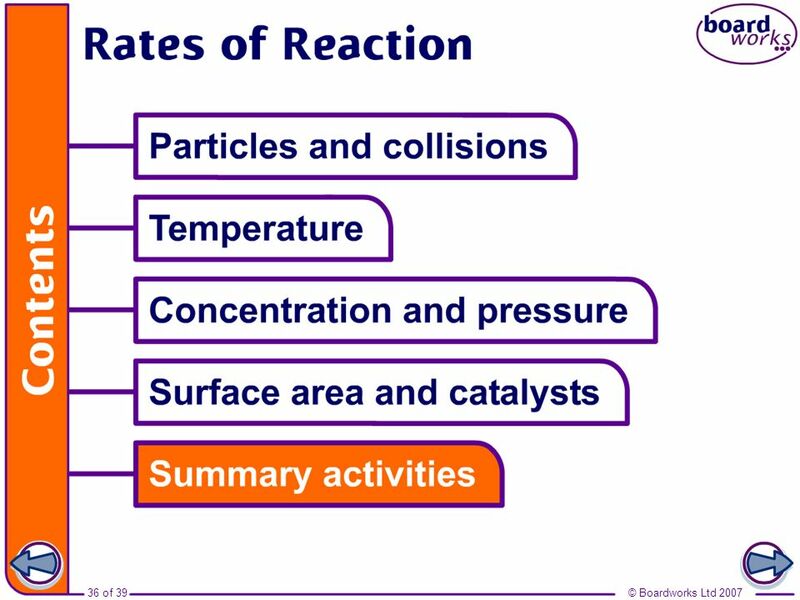 Boardworks GCSE Additional Science: Chemistry Rates of Reaction Catalysts are substances that change the rate of a reaction without being used up in the reaction. Catalysts never produce more product – they just produce the same amount more quickly. 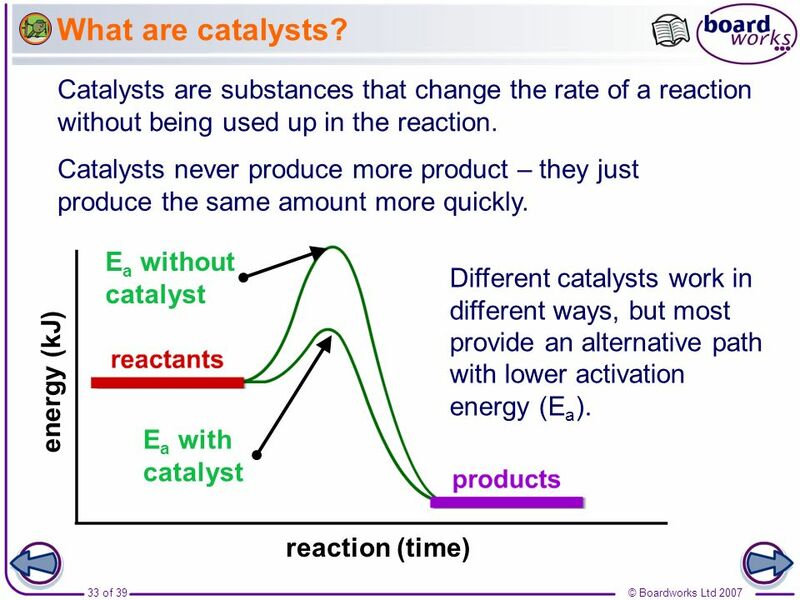 reaction (time) energy (kJ) Ea without catalyst Different catalysts work in different ways, but most provide an alternative path with lower activation energy (Ea). Ea with catalyst Teacher notes See the ‘Energy Transfer’ presentation for more information on activation energy. 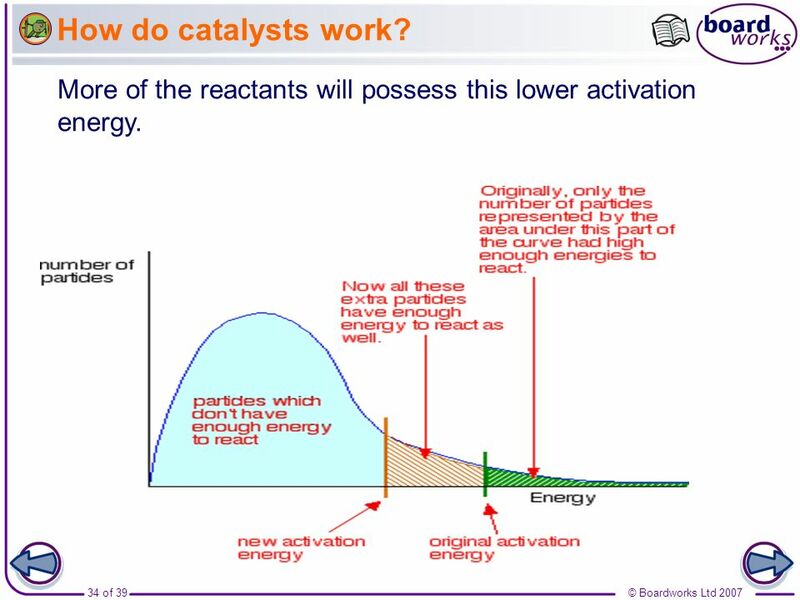 How do catalysts work? 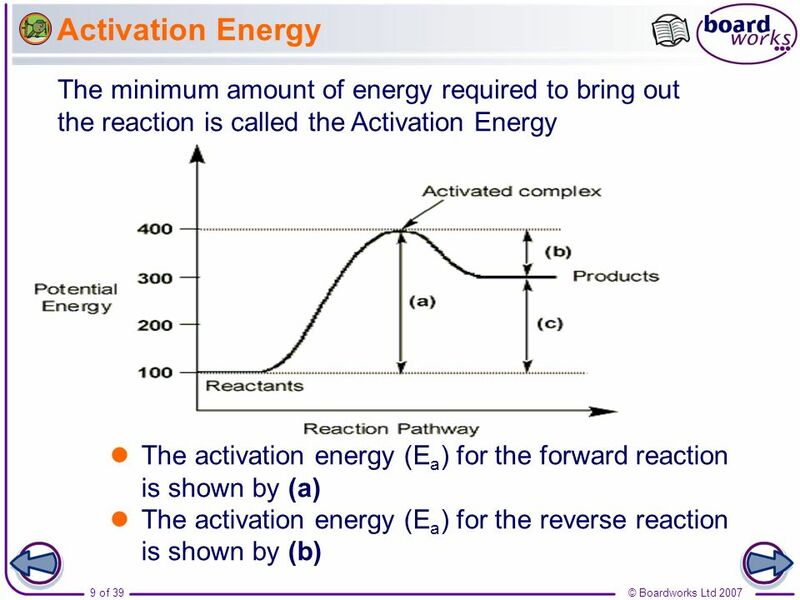 Boardworks GCSE Additional Science: Chemistry Rates of Reaction More of the reactants will possess this lower activation energy. Teacher notes See the ‘Energy Transfer’ presentation for more information on activation energy. 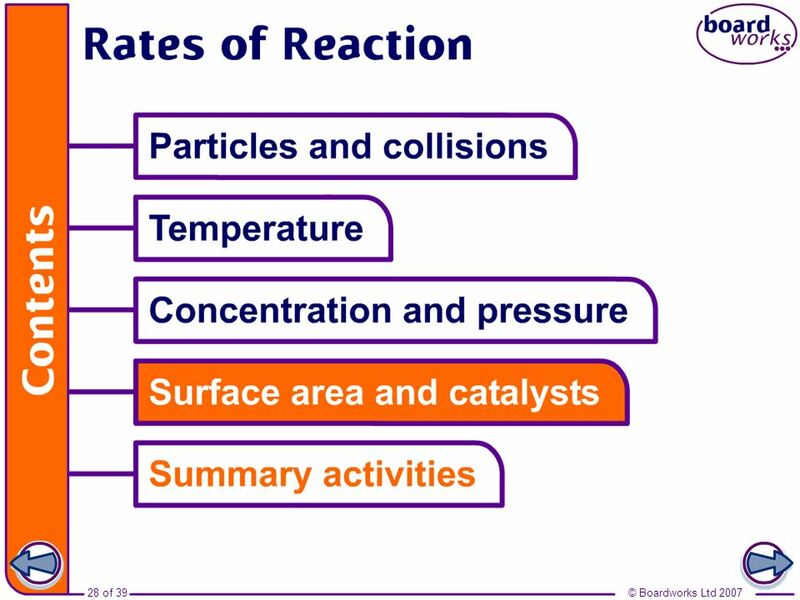 Everyday catalysts Boardworks GCSE Additional Science: Chemistry Rates of Reaction Many catalysts are transition metals or their compounds. For example: Nickel is a catalyst in the production of margarine (hydrogenation of vegetable oils). Iron is a catalyst in the production of ammonia from nitrogen and hydrogen (the Haber process). Platinum is a catalyst in the catalytic converters of car exhausts. It catalyzes the conversion of carbon monoxide and nitrogen oxide into the less polluting carbon dioxide and nitrogen. Photo credit: © 2007 Jupiterimages Corporation Teacher notes See the ‘Reversible Reactions’ presentation for more information on the Haber process. 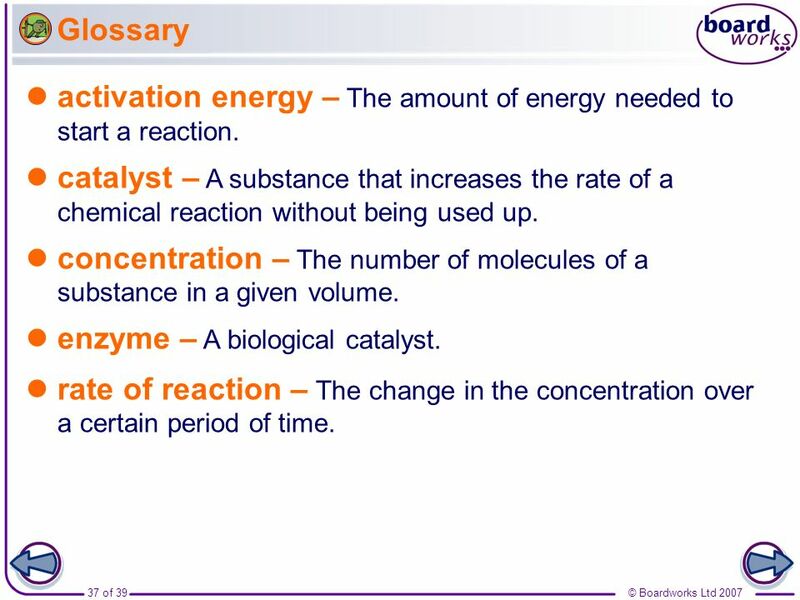 Glossary Boardworks GCSE Additional Science: Chemistry Rates of Reaction activation energy – The amount of energy needed to start a reaction. catalyst – A substance that increases the rate of a chemical reaction without being used up. concentration – The number of molecules of a substance in a given volume. enzyme – A biological catalyst. 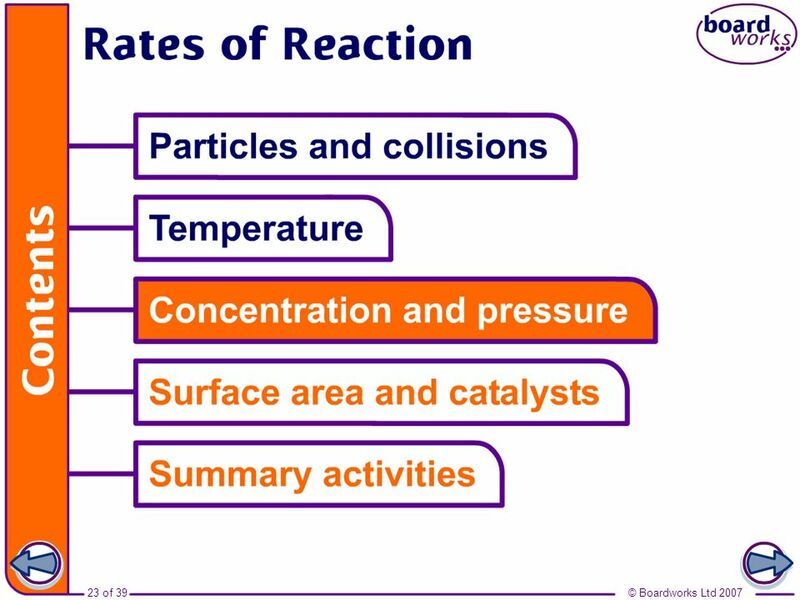 rate of reaction – The change in the concentration over a certain period of time. 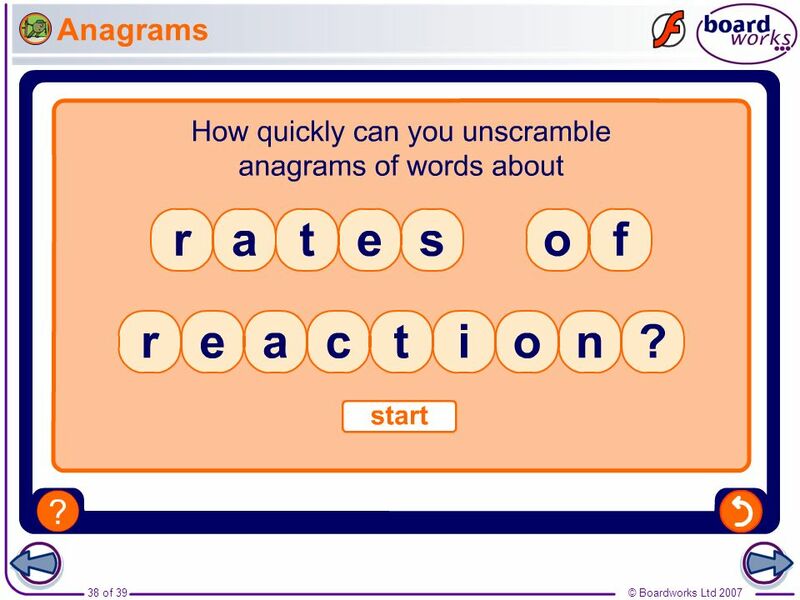 Boardworks GCSE Additional Science: Chemistry Rates of Reaction Teacher notes This completing sentences activity provides the opportunity for some informal assessment of students’ understanding of rates of reaction. 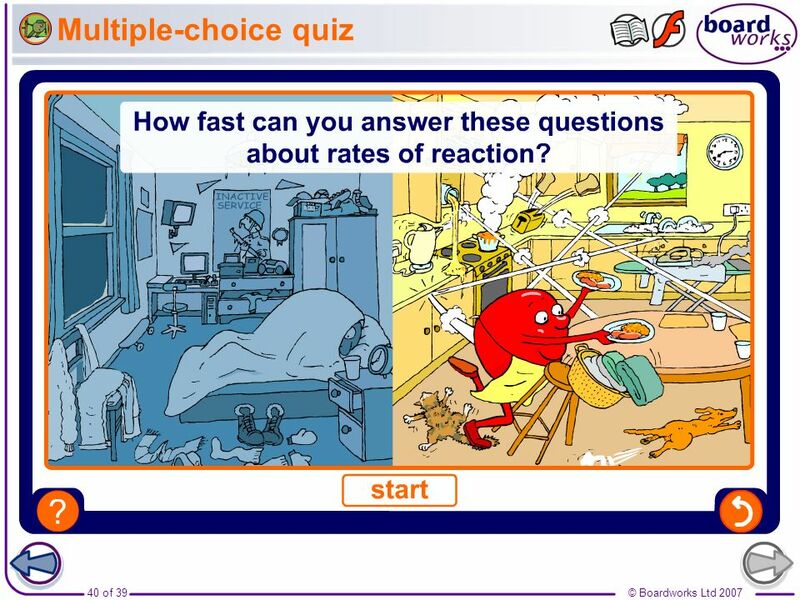 Multiple-choice quiz Boardworks GCSE Additional Science: Chemistry Rates of Reaction Teacher notes This multiple-choice quiz could be used as a plenary activity to assess students’ understanding of rates of reaction. The questions can be skipped through without answering by clicking “next”. Students could be asked to complete the questions in their books and the activity could be concluded by the completion on the IWB. 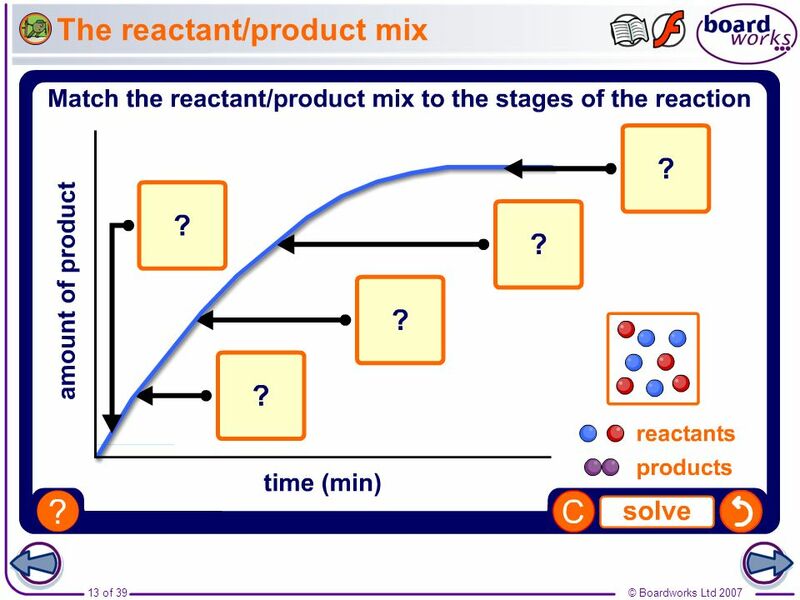 Download ppt "Boardworks GCSE Additional Science: Chemistry Rates of Reaction"
NATIONAL 4/5 CHEMISTRY CHEMICAL CHANGES AND STRUCTURE LESSON 1 REVISION OF FACTORS THAT SPEED UP A REACTION. BL TIER 3 TIER 3 Identify suitable experimental procedures for measuring rates of reactions Identify the factors affecting the rate of a reaction Calculate. Kinetics Topic 6 ge/chemistry/gilbert2/chemtours. asp#16. 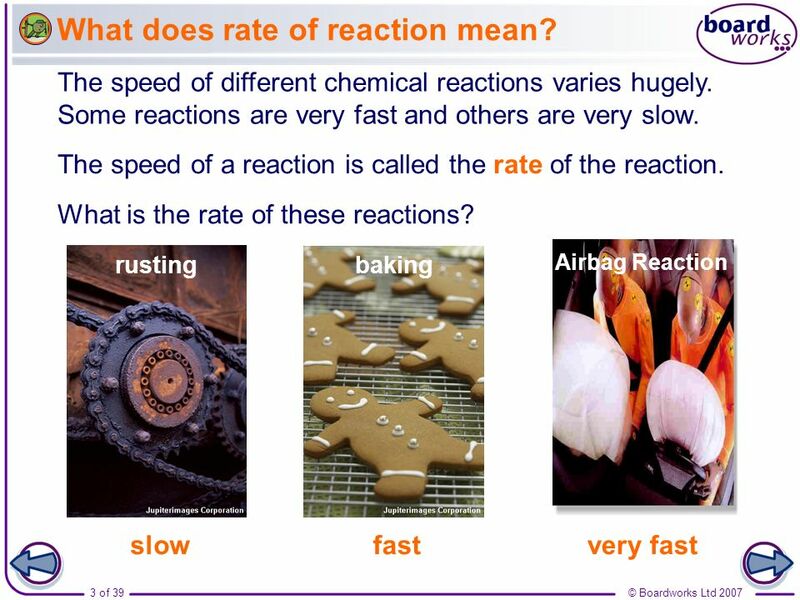 TOPIC 2 Speed of Reactions A chemical reaction can be represented by a Chemical Equation. A chemical reaction can be represented by a Chemical Equation. KS4 Chemistry Rates of Reaction. Kinetics. 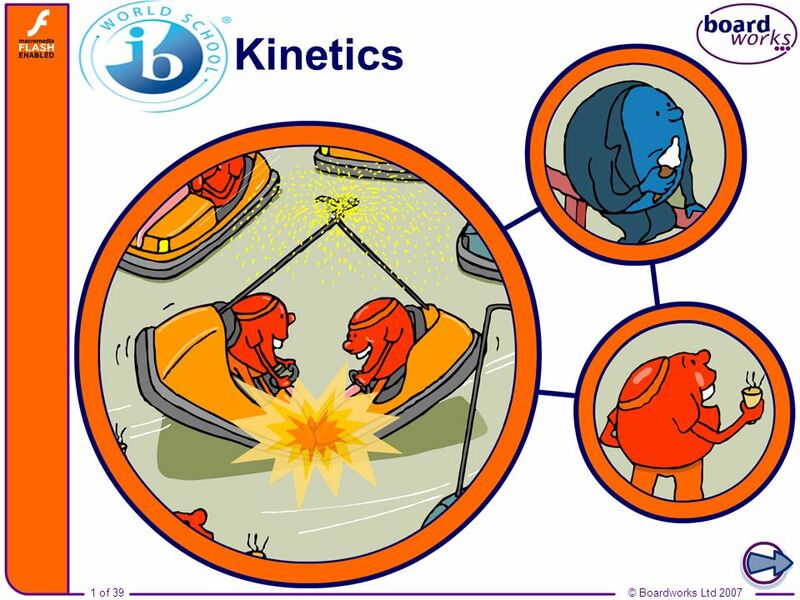 Kinetics - rates of chemical reactions and the mechanisms by which they occur Rate of a chemical reaction - change in the concentration of products.